Crest Pro-Health is accepted by the American Dental Association for seven different benefits: Cavities, gingivitis, plaque, tartar, whitening, sensitivity, and bad breath. Crest Pro-Health toothpaste contains two powerful ingredients: Therapeutic stannous fluoride to protect against gingivitis, plaque, cavities and tooth sensitivity; and sodium hexametaphospahte, a stain-fighting ingredient. 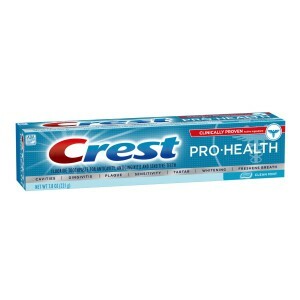 Crest Pro-Health toothpastes deliver our most comprehensive protection for your teeth.